The Establishing Shot: Grindhouse Horror returns to London with a special once off screening of V/H/S in an old skool VIDEO SHOP 16 Jan - GET YOUR TICKETS & exclusive VHS copy of V/H/S NOW! Grindhouse Horror returns to London with a special once off screening of V/H/S in an old skool VIDEO SHOP 16 Jan - GET YOUR TICKETS & exclusive VHS copy of V/H/S NOW! On Wednesday 16 January Momentum Pictures are hosting a very special immersive preview screening of their hit horror film V/H/S to commemorate the release of V/H/S on 18th January 2013! If you don't know about V/H/S yet - A) which rock have you been hiding under? And B) V/H/S sees the classic anthology horror movie given a contemporary and brilliantly visceral spin by some of the hottest directors working in the the genre today - Adam Wingard (You’re Next; A Horrible Way To Die), David Bruckner (The Signal), Glenn McQuaid (I Sell The Dead), Joe Swanberg (Hannah Takes The Stairs) and Ti West (The Innkeepers; Cabin Fever 2: Spring Break; The House Of The Devil). In V/H/S a small group of misfit friends and petty crooks are hired by a mysterious man to break into a derelict suburban house with the sole purpose of finding and stealing a rare VHS videotape. As they search through the tapes, playing them in turn, they are treated to a succession of graphic and apparently genuine video recordings, each one more shocking and bizarre than the last. If you are as bored of the found footage genre as I am V/H/S probably won't change your mind - but it is a damn entertaining and imaginative romp seeing what fresh talent can do given the opportunity. Highly original, brutally uncompromising, creative, diverse and, most important of all, genuinely creepy and enormously entertaining, V/H/S is one of the most entertaining and surprising horror films we have seen in a long time. Momentum Pictures are proud to present a one-off early screening of V/H/S where for one night only you can go back in time to the glory days of VHS! Come join us on Wednesday 16th January at 6.30 at the one night only that ‘Cellar Rentals’ will exist at the Blackhall Studios in London for a pre-drink followed by an exclusive screening of the film at 7pm complete with popcorn. Should you survive this portion you'll then be able to join us in our loving tribute to the days of VHS as we're building an old-skool rental store for one night only. Look through the covers, enjoy complimentary drinks and other fun items in this rare chance to go back to the heady days of choosing tapes. 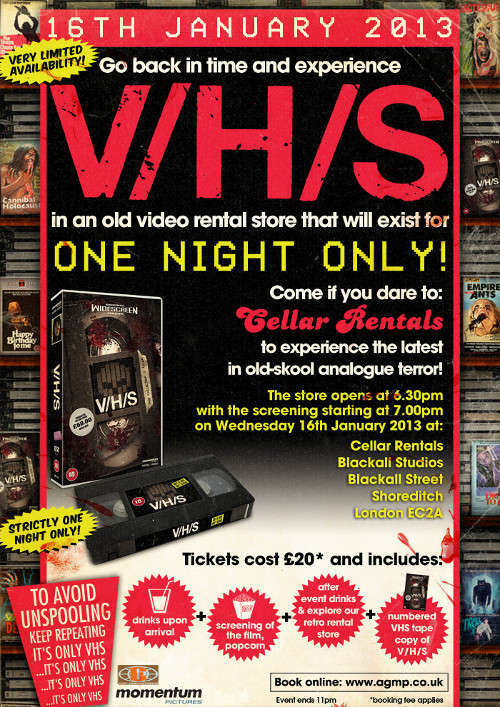 The best bit of all - you'll get to leave with a rental big box VHS tape of V/H/S! Only 300 exist and they're numbered and this will be the ONLY SURE WAY to get hold of one of these rare collectors items.